One of the biggest errors that businesses make is that they mistake an objection a prospect raises as a sign of disinterest. If a prospect raises an objection during a call, and the caller can’t solve the problem on the spot, many businesses will dismiss the lead as ‘dead’, and move on. In actual fact, if a prospect goes to the trouble to tell you why there is an issue, this shows an overall interest in reaching a positive outcome. It may not be possible to solve this issue on the call. However, by educating the prospect, everything can change. This is why one of the most useful things a business can do is to identify the 3 most common objections that arise in sales calls. 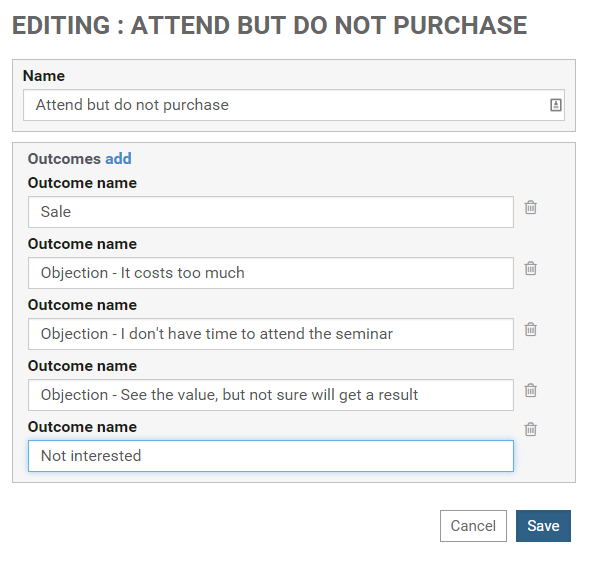 What is the value of the result that the attendee will achieve? How much will that result be worth in 3 years time? If you achieve this result, what other potential benefits and future results will stem from the original result? Will the seminar save you time? If you don’t attend the seminar, how much time will be wasted? Each of these bullet points need to then be converted into 1-3 discrete email messages so that after the call, the prospect is sent a series of high-value emails. These emails both help the prospect move towards the desired goal and simultaneously position your product as an indispensable tool to achieve this outcome. LeadMachine helps you achieve this goal through the use of Task Outcomes. You start by creating a Queue. Think of a Queue as a type of a task. For example, you might have a Queue for confirmation calls and a separate Queue for people who attend a free seminar but do not purchase. Each Queue has its own set of task outcomes. Task outcomes would include ‘Sale’, ‘Not interested’ and your top 3 objections. 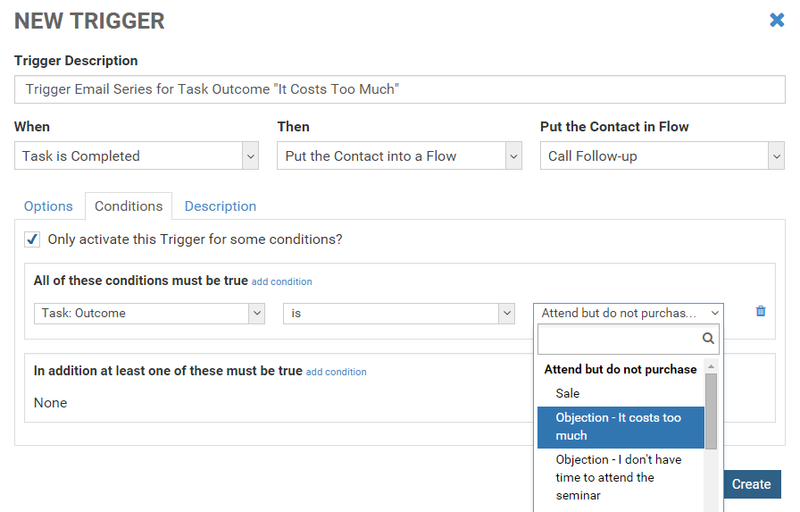 Then you can use a Task Outcome to trigger a Flow. In this case, the Flow would be a series of email messages. If a prospect clicks on the link of an email, you may wish to …. The way you structure it will depend on your business. The great thing that happens now is that when the caller completes a call, the Task Outcome will trigger the Flow that you have nominated. The caller then presses ‘Take next Task’ and moves on to the next call. It’s efficient, everyone gets followed up, and your business ends up with more sales.